To be completely honest, I wasn’t expecting this meal to be as delicious as it was. I was pretty sure I would forget something and ruin it by adding my own spin, which is something I can’t not do when I cook. It’s a little bit time-consuming, but trust me, it’s worth it. Definitely a weekend dinner than a weeknight dinner. I don’t remember where I got the chicken recipe from, but the maple gravy is Rachael Ray’s baby, I changed it a wee bit to suit my tastes. Also, I made chicken strips, because I’m not sure about cooking times for bone-in chicken. It doesn’t really make a difference unless you’re a particular fan of bones in your meat. I don’t have a special recipe for waffles, we just made them from an Aunt Jemima mix WHICH, let me tell you, is so delicious it should be gourmet. Anyway. This recipe makes about 2-3 servings. It made 2 for me, because I am a pig. Combine 1 cup of flour, 1 cup of crushed All Bran Flakes and seasoning of your choice. Make sure the bran flakes are coated in flour. Place the mixture on a plate. On another plate, spread half a cup of plain flour. Beat the egg in a bowl. Step 3: Bran flakes/flour/seasoning mixture. Coat each chicken strip in flour, dip it in the egg and then coat it with the Bran Flake mixture. Place these on a greased baking tray. Bake them for aout 15 minutes or until golden brown on each side. I kept switching between medium-high heat, I had the high heat on when I put the stock in, just so it would simmer quickly, but was on the medium for the rest of it. The original Rachael Ray recipe called for butter, not olive oil and just rosemary and no onions or anything. But I like flavour in my gravy so I just adapted it to my tastes. And since the waffles were fatty anyway I decided to use olive oil. Fry your garlic and onion in the olive oil till it’s soft. Then pour your chicken stock in along with the rosemary. Turn the heat to high, and when it starts to simmer, Whisk in the flour. Whisk, not stir, because I stirred and had to do so for 20 minutes to get the lumps out. Add your parsley and mushrooms at this point and let the gravy thicken. When it’s thick enough to your liking, add the maple syrup and take it off the heat. Your gravy should be lovely and glossy. You can either run this through a sieve (pick out the mushroom and plop them back in if you used them) and use just the liquid or eat it as is. We ate it as is because we didn’t have a sieve. The maple syrup gives the gravy a delicious smokey-sweet flavour that contrasts nicely to the spicy-ness of the rosemary. 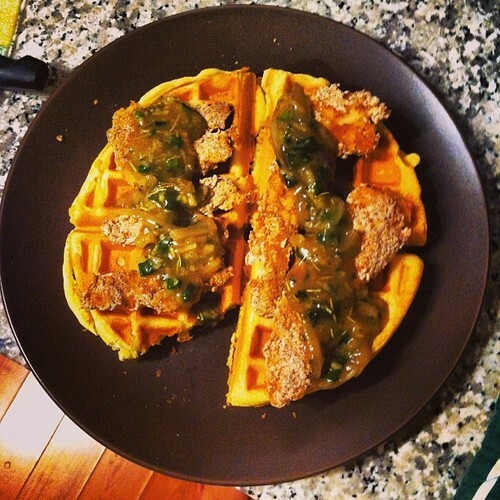 To assemble, put your waffles on a plate, place the chicken strips on top and drizzle with your gravy. Super, super delicious. Parfaits are ideal dorm food. They have healthy yoghurt, fruit and some nice, fibre-rich granola. If you get the healthy kind, it can be one of the healthiest, yummiest snack or dessert. I’m not one of those people that reaches out for a parfait at Second Cup, I usually make a beeline for the chocolate cake. It’s probably because all the parfaits in stores & cafes look so dead and dull. They don’t look delicious. These ones, they have these amazing contrasting flavours that explode in your mouth– the cool yoghurt with the warm granola, the soft yoghurt and blueberries with the crunchy almonds and caramelized oats, the tangyness of the greek yoghurt and the sweet, smokey caramelized brown sugar on the granola, all make spending an extra ten minutes making your own granola worthwhile. I was watching Best Thing I Ever Ate on Food Network and one of the chefs, I think it was Tyler Florence who said the best thing (crunchy or sweet, I can’t remember) he’d eaten was some sort of granola at a cafe. The chef at the cafe cooked it over a stove and then baked it, making it super crunchy and warm. 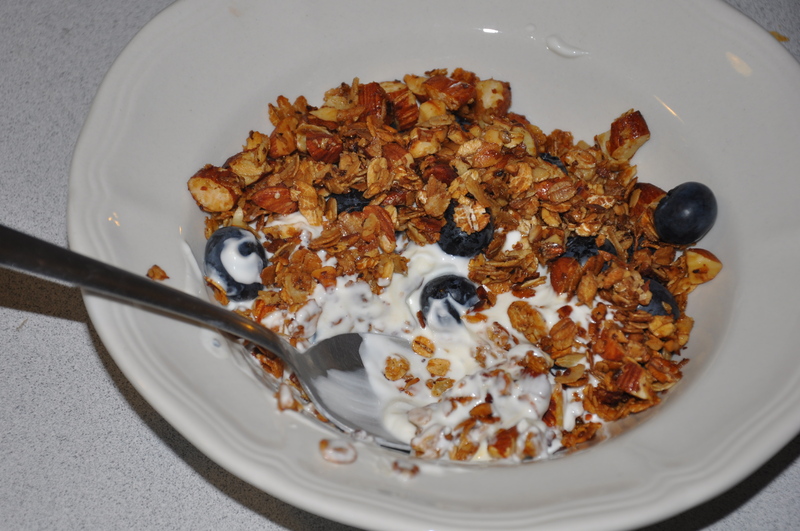 I loved the idea of making your own granola. I also have a jar of oats and a bag of brown sugar both of which need to be used up soon so I decided to make my own granola. I’ve also taken a serious liking to Mediterranean probiotic yoghurt (which has a lot of health benefits, one of which is reducing chances of colon cancer) which is creamy and tangy. I figured the sweet granola would go amazingly with the tangy yoghurt. 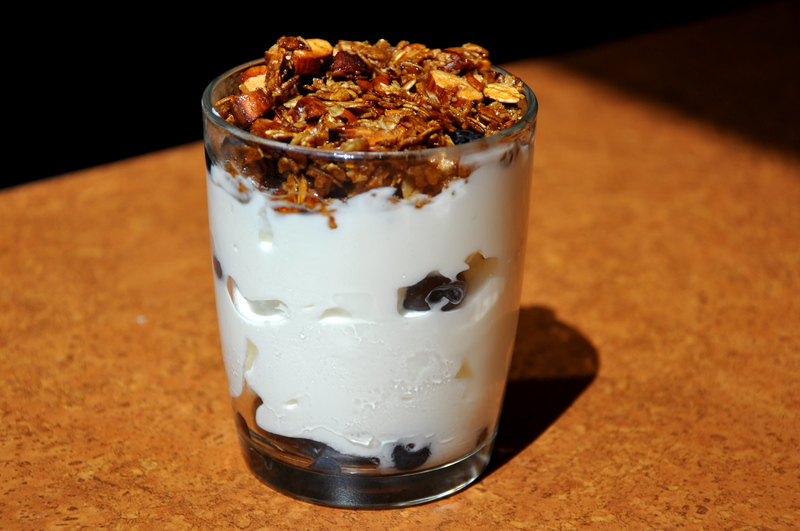 Here’s a picture and a quick way to make your own granola! Toast the almonds on a pan without any oil or butter. They are done when they smell nutty. Add some oats and toast them a little bit too, add a tiny pad of butter, maybe around a teaspoon. Crumble about one and a half to two tablespoons of brown sugar and sprinkle some salt. Keep stirring and add about two tablespoons of water to let the sugar caramelize around your oats and nuts. You can add cinnamon if you like, but the brown sugar and almonds make it so flavourful, you really don’t need it. Serve on top of yoghurt with fresh berries. I used blueberries because I recently learnt that they are very high in anti-oxidants and great for you.